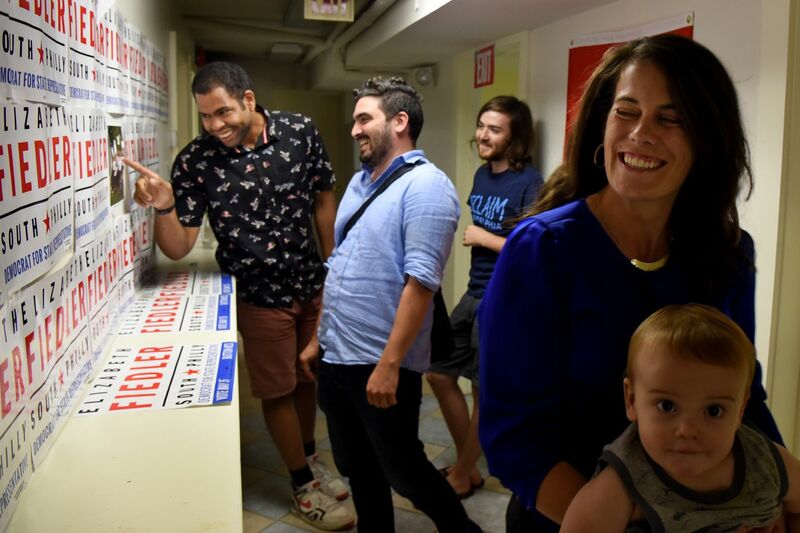 Members of the semi-spiritual progressive group Reclaim Philadelphia reminisce while looking at a group photo taken during the May primary election campaign, as they prepare to meet in South Philadelphia July 9, 2018. From left to right are: organizers Rick Krajewski, Lev Hirschhorn, Nicolas Pastore, and Elizabeth Fiedler, Democratic candidate for the state House, holding her son, Louis Fiedler-Rackes, 1. One of the most successful progressive groups in the city, it recently took over a couple machine-controlled wards. Nikil Saval is opening up to dozens of people about one of the most harrowing experiences of his family's life. He's at a city rec center, where the left-wing group Reclaim Philadelphia is meeting, on a muggy June night. Technically, the 35-year-old literary magazine editor is speaking about the dearth of affordable housing. But instead of simply rattling off wonky statistics, he's talking about the fact that his parents were forced to leave the country after costs skyrocketed in their Los Angeles neighborhood. "They sold their house and moved back to India," Saval said, "abandoning their 30-year-long project to make a permanent life in the United States." Through the evening, young leader after young leader of Reclaim Philadelphia shares the experiences that have fueled their political activism. A man tells the crowd his mother was arrested on Christmas Eve for driving a car involved in a robbery, and why that inspires his fight for criminal justice reform. A woman talks about being raped in college, and how that powers her work against sexual violence. It's gritty, emotional, it speaks to the almost surprisingly vulnerable — and it's working. Reclaim Philadelphia has been a major force behind the left wing's biggest victories in the city in recent years. Larry Krasner, the progressive district attorney, said the organization played a "key role" in his 2017 victory by harnessing "populist and grassroots energy." In the spring, Reclaim's members provided critical support to Democrats Elizabeth Fiedler and Joe Hohenstein, who both won primaries for the state legislature against candidates backed by the city's powerful electricians union. Also, Fiedler's husband, Reclaim member Adams Rackes, was elected last month to lead a ward long run by the Democratic establishment. So was Saval, a co-founder of the group. "They have a track record of almost two years of winning, and the places they've won have been strongholds of traditional machine operations," said political consultant Mustafa Rashed. "At this point, you'd have to classify it as an insurgency. They're a force to be considered in any election moving forward." In a sign of how quickly politics has changed after President Trump's campaign, Democratic power players now seem to be kissing Reclaim Philadelphia's ring. City Councilwoman Helen Gym and Deputy Mayor Rich Lazer attended its two-year anniversary party in May at the Boot & Saddle Bar, and state representative candidate Mike Doyle went to the June meeting. But the lion's share of the group's electoral successes have occurred in gentrifying neighborhoods full of new, young voters. Most of its members are also white, while the city is majority-minority. Can it prevail among a larger swath of the electorate? "It is yet to be seen whether it can translate to the city as a whole," said Rashed, adding that if the organization began making gains in places like North Philly's 181st District, a largely black, low-income area, "that would impress me." Reclaim's leaders argue that they've won elections largely because their progressive message is resonating in the Trump era. Members talk about pursuing "a political revolution in Philadelphia" and the "radical redistribution of wealth and power from corporations and billionaires." They support policies such as Medicare-for-All, free college, and a $15 minimum wage. "People are struggling, and we are speaking directly to that," said Lev Hirschhorn, another co-founder. But the group's honchos also attribute their success to their highly personal way of organizing: They don't just talk to each other at meetings about their experiences with income inequality, sexism, and racism. They also speak to voters about injustices they've lived through — and encourage them to open up, too. "It's shockingly effective," said Hirschhorn. "But it's not as revolutionary as it sounds. It's only revolutionary in the sense that the Democratic Party isn't doing it." It's known as "deep canvassing," and this is what it looks like on the campaign trail: Fiedler and her then-campaign manager, Amanda McIllmurray, who is a co-founder of Reclaim, knocked on a 20-year-old voter's door during the primary. They asked him: What are the issues that matter most to you? What are you struggling with right now? "He started to cry," said McIllmurray. "He said, 'Planned Parenthood is going to be defunded and I rely on that. My girlfriend just had an abortion a few days ago, and if I didn't have Planned Parenthood, I would be forced to be a father when I can't even pay my own bills.' "
Fiedler then promised the voter she'd support the abortion rights group, she said. The numbers argue that this strategy is working. In the 2017 district attorney's race, Reclaim said that 64 percent of 18- to 35-year-olds that it and related organizations canvassed came out to vote, compared to just 29 percent of those who didn't have contact with the group. In white, working-class voting divisions where Reclaim and the other associations canvassed, Krasner won 48 percent of the vote on average, the group said; in areas where it didn't, 20 percent. Fiedler, a former WHYY reporter, said Reclaim "helped me refine my platform," "build relationships with labor unions," and "gain volunteers." Hohenstein, an immigration attorney whose field director in the primary was a founding member of the group, said "Reclaim always seeks to listen as much as it seeks to speak out, and that was one real important feature for my race" in the River Wards' 177th District. Along with those two candidates, the organization endorsed State Rep. Chris Rabb, a Northwest Philly Democrat who secured his party's nomination this spring against a machine-backed candidate, as well as longtime incumbent State Rep. James Roebuck. Reclaim Philadelphia's fiscal sponsor is the liberal group Keystone Progress' 501(c)(4). Often called "dark-money" nonprofits, 501(c)(4)s typically aren't required by law to disclose their donors. Reclaim's leaders said it lists their contributors on their website: In 2017, the organization said it received almost $36,000 from individuals' membership dues and $70,000 in grant funding from the institute People's Action. Reclaim Philadelphia might be on a winning streak, but it was born in the wake of a major loss. After Bernie Sanders struck out in his 2016 bid for president, heartbroken ex-staffers and volunteers got together to figure out what to do next. "We said, we built something really great here, and we don't want to see it die out," said McIllmurray. The left-wingers began by staging protests around the Democratic National Convention, railing against the establishment's "moneyed interests." Today, Reclaim Philadelphia has about 350 dues-paying members, plus an extra few hundred or so who participate regularly, McIllmurray said. It is officially a chapter of Our Revolution, the national political organization formed out of Sanders' campaign. The group has also won admiration from some of its former foes. "Reclaim is just checking the oil under our hoods," said John Dougherty, leader of the city's electricians union. "I respect what they're doing." After such a big couple years, what's next? Rick Krajewski, a criminal justice organizer for Reclaim, said the group is about to launch a program to help support families of prisoners. Members are also thinking about how they can use 2019 — when Mayor Kenney and Council members are up for reelection — "as a way to really make a progressive push in Philadelphia," he said. Krajewski said the group does have an internal issue: It needs to diversify. At the June meeting, one member told attendants that the room was too white. "It's absolutely a problem," said Krajewski. "Reclaim leadership is very clear that we need a multi-class, multi-racial movement if we want to create change. … We need to be talking about racial justice, economic justice, education justice, and we need to talk about it in ways that people directly relate to." Observers will likewise be watching to see whether Reclaim Philadelphia can expand its power beyond changing neighborhoods in South Philly and the River Wards. Louis Agre, a longtime ward leader, said Reclaim's economic message can resonate with more traditional Democrats: "They believe in fair taxation, jobs for young people, and a lot of the things that Reclaim believes in. … They're hopefully the future of the party." But the organization may find it more challenging to win over those voters on "some of the social issues," he said. Reclaim Philadelphia's leaders and endorsed candidates said they aren't taking anything for granted. "Someone in the political establishment suggested that my victory was a fluke, a onetime thing," said Fiedler. "I do not believe that is true. But I would say that it is up to all of us and our neighbors to decide what happens next."